My shop (Suburban Tire) charges $100/yr. 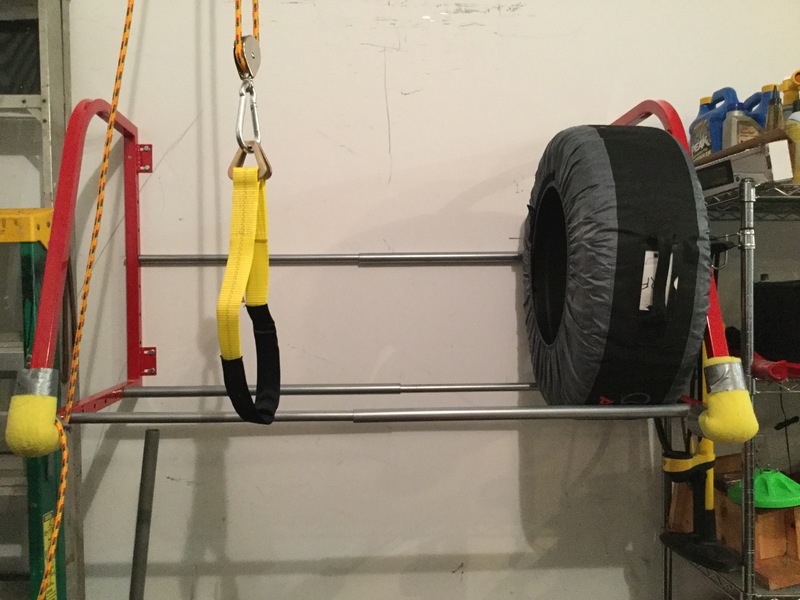 I got the Audi "Tire Totes" and felt pads which we installed before they went into storage. Good investment, they really protect the wheels. Last edited by Cadx6; 10-31-2016 at 08:34 AM. The wheels didn't come with any lug bolts but I contacted the seller & he verified that they use the stock (ball) bolts. We also physically verified this at the tire shop. Thanks for sharing. $100/yr is a very good price. The two local Audi dealers quoted $250/yr and $400/yr. Did you get the totes and felt pads online? Right after I picked up the car I got a coupon in the mail from the dealer for 20% off any accessories through their parts department. Used it to get the Tire Totes & pads as well as two sets of logo puddle lights (also had the wife's new A4 on order at the time). Saved a bunch of money. I'm sure though, if you do a little shopping online, you could do better than the dealer's retail price. I kind of wanted to store the winter set at the dealer but despite being newly constructed, they don't even offer that service. Last edited by Cadx6; 10-31-2016 at 12:04 PM. I have used Pirelli Scorpion Winter XL... I wanted Dunlop WinterSport however not available in 21" fitment. I was told by a few MB owners that these work great, apparently the popular choice among Canadian MB Drivers. I did not have any issues or complaints. Audi Q5, SQ5, and Q7 oem wheels use R14 (14mm radius) ball seat lugs. Audi A3, A4, A5, A6, A7, A8, TT, and S/RS derivatives use R13 (13mm radius) ball seat lugs. Many aftermarket replicas wheels use conical seat lugs... so you must use caution in determining if this is the case so that you don't mistakenly use the oem R14 or R13 ball seat lugs that came with your car on the conical seat replicas. There are exceptions: Hartmann wheel replicas and possibly a few others also use R13 ball seat lugs, which means you can reuse the lug bolts that came with your new Audi sedan or coupe. However, if you have a Q5, SQ5, or Q7, then you'll need to acquire a set of R13 lug bolts because the R14 would not properly seat on the Hartmann wheels without possibly causing damage or inaccurate torquing of the bolts. Since I'm using original Q5 S-line 20" peelers as winter wheels on my Q7, the R14 bolts that came with the Q7 will properly seat on these wheels. Basically, unless you're mounting a set of original Audi Q5 or Q7 wheels on your Q7, you should not be re-using the R14 lug bolts that came with your Q7 and will need to acquire a different set of lug bolts (conical, R13, or whatever) that will properly seat on your aftermarket wheels. Last edited by larryV; 10-31-2016 at 07:55 PM. I had the same issues as you. I installed a tire rack in my garage (purchased from Amazon). I then installed a homemade block and tackle to lift the wheels into position. The 21" wheels are HEAVY. Still have plenty of room for a third car or whatever else needs to be stored there. Did a lot of research on the winter wheel setup. Ended up going with 19" replicas same design as the 20" models shown earlier in the thread. They match the 21" nicely. Bought 255/55 r19 Michelin x ice i2 for $229/ea mounted and balanced. All 4 fit easily in the back even with one if the second row seats occupied. Purchased r13 lug bolts on eBay for less then half ecs tuning is charging. Center caps purchased off amazon. All in all everything worked out great. Glad to have the winter set vs the all seasons here in the northeast. Curious to see how he car rides as the with the summer rubber, the ride is as smooth as glass. Thank you, Jalf, Cadx6, Larry and everyone else. The information you've all shared is incredibly helpful. Although, the more you share, the more questions I have. I hope you'll bear with me. Will these fit the 2017 Q7? If I do end up needing the R13 ball lugs, what do I search for on Ebay/Amazon, etc? Ebay returns several listings for R13 ball lugs with different shank sizes (32mm, 40mm, etc. ), so I'm confused. Lastly, I see that some of you are not going down too much in wheel size. For those getting 275/45/20 for your winter setup, are you not giving up some winter performance compared to a higher profile tire on say a 19" wheel? I'm worried the 19s might look puny on the Q7 but also don't want to give up meaningful winter performance just for looks. Interested in your thoughts. That's the same seller I got mine from. Very quick shipping & good customer support via e-mail. When I asked, they told me that the wheels would use the OEM R14 ball lugs. I take that with a grain of salt since they're not Audi experts, but maybe Larry can weigh in. When I get ready to change over, I'll get with my guy @ the tire shop & verify if I need R13's. I decided to just go down to 20s since I hate the look of small wheels on a vehicle as big as the Q7 and where I am, we don't regularly get 4 foot blizzards & the roads get plowed fairly quickly - plus, those Blizzaks are pretty aggressive, much more so than your average "all season".